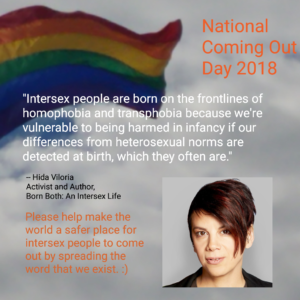 Hida Viloria | Celebrating National Coming Out Day! I’ve been out longer than I care to divulge –or I guess I should say, “divulge here,” as anyone who’s read my memoir knows exactly how long it’s been since I came out! 🙂 — but so many are still not safe enough to do so. Please help make the world safer for them by spreading the word that L,G,B,T,Q, and particularly, I for intersex, people exist, and we are healthy and beautiful! A great resource to educate about the little known I is the UN Intersex Fact Sheet, which I’m proud to say I helped create. Please share it widely. ← U.S. Judge Rules in Favor of Nonbinary Passport!